Urgent Farm Bill Action Alert! Call your Representatives today!! After months of quiet on the 2013 Farm Bill front, things have changed -- fast. We’ve seen the House Agriculture Committee’s draft bill – and we’ve got a problem. The farm bill plays a huge role in fostering economic opportunities for farmers – and for rural communities across the country. But they left out some critical pieces that directly help farmers and would-be entrepreneurs get access to the financing they need for their businesses. And, to make matters worse, they’re trying to gut basic protections for independent family livestock producers at the request of a few large corporate interests. will you call right now? California has a number of members on the House Agriculture Committee - and we’re counting on their support. The committee will vote on amendments to the bill tomorrow, so they need to hear from you today! Call your Representative to ask for support on three amendments: Gibson #46, McIntyre #40, and Costa #69. California’s Rep. Costa’s amendment #69 restores funding for a program that helps to offset the annual cost of certification for organic farmers. Rep. Gibson’s amendment #46 ensures that all farmers are able to access loans, including farmers in regions with high land prices. Rep. McIntyre’s amendment #40 restores funding for the Rural Microentrepreneur Assistance Program, a successful program that provides low-interest loans to small rural businesses. (When calling Rep. Costa, thank him for his work to support organic certification cost share for farmers and urge his support for amendments by Gibson (#46) and McIntyre (#40)). We can’t emphasize it enough - the next 48 hours will have an impact on food and farms for years to come. And we won’t get a better farm bill - and a better future for our nation’s food, farmers, and communities - without your help. Make that quick call right now - and help us spread the word! P.S. Wondering what happens next? Check out our take action page! 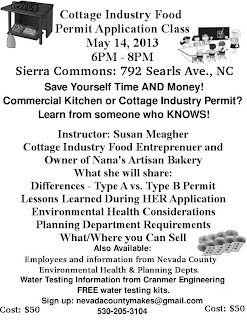 Cottage Industry Food Permit Class Tomorrow! Action Alert: Tell your legislator to support beginning farmers! The farmers and ranchers across the country who feed us are getting older - the average American farmer is 57! Now is the time to invest in the next generation of folks who want to raise our food and steward the land. They’re going to be job creators, entrepreneurs, and innovators – as long as we help them get the tools they need to succeed. • Enable access to land, credit, and crop insurance for new producers. 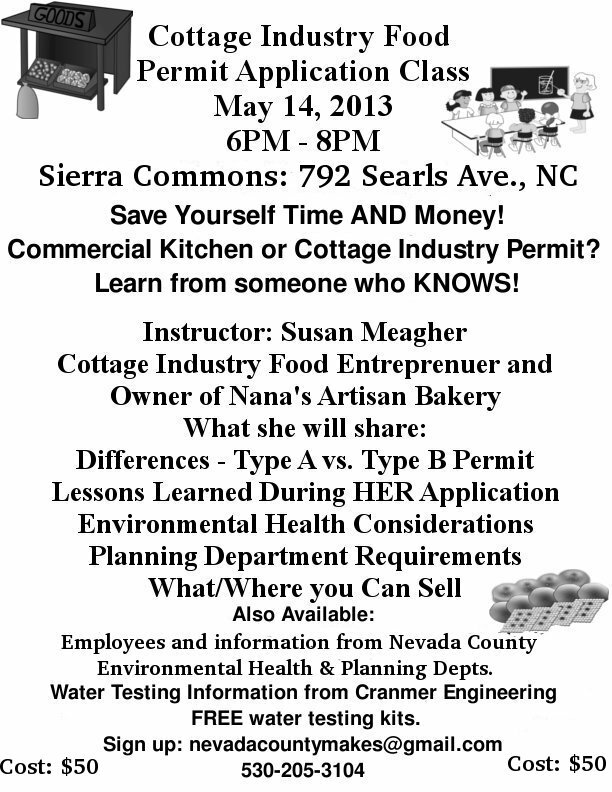 • Help new producers learn to become good land stewards. • Provide training, mentoring, and research that beginning farmers and ranchers need to be successful. • Connect military veterans with job opportunities in agriculture. Congress had the chance to include these critical needs in the 2012 Farm Bill, but their inability to pass that bill last year meant that the Beginning Farmer and Rancher Opportunity Act was left behind. Your legislators will begin working on the 2013 Farm Bill soon – so now is the time to make sure support for beginning farmers is not forgotten! Can you make a call today and ask your legislators to co-sponsor the Beginning Farmer and Rancher Opportunity Act of 2013? Legislative co-sponsors are vital for the success of this bill – they can help move the bill through Congress and ensure pieces of it are included in the next farm bill. Before you make a call, [check here]! If you see your legislator on this list of co-sponsors, make your call a THANK YOU call! I am a constituent and a voter. (tell ‘em if you’re a farmer!) Supporting beginning farmers and ranchers is a critical investment in the future of American agriculture. Please co-sponsor the Beginning Farmer and Rancher Opportunity Act of 2013 today! Call today – it takes just a few moments to deliver this important message. Thanks for speaking out! Your voice will make a difference! Want more information on the bill? Check it out here. A webinar to help farmers selling or desiring to sell produce to wholesale markets, restaurants, schools or grocery stores requesting documented food safety programs by the farm operations they buy produce from. Webinar Sponsors: The Webinar is sponsored by the USDA Office of Advocacy and Outreach, the Ag in Uncertain Times Team, and the University of California Small Farm Program’s Food Safety Education Project.